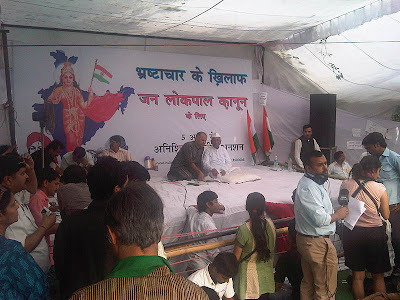 Anna Hazare’s second fast (August 2011) in Delhi, demanding the acceptance of his teams’ draft for Janlokpal bill has raised many different debates about the nature of this upsurge and how the social action groups, engaged in the process of struggle for Human rights of different sections of society, should relate to such movements. Just to recall the first such fast was taken by Hazare was undertaken in April 2011, on the issue of Jan Lokpal Bill. Around that time there was a competing movement by Baba Ramdev for getting back illegitimate money stashed abroad. While Hazare withstood the pressures of state to resurface again, Baba Ramdev collapsed soon enough and tried to run away wearing women’s clothes. Hazare’s, ‘Team Anna’ has diverse people, engaged with different social issues, including reforms in judiciary, bonded labor, communal amity etc. Many of them have been rubbing shoulders with grass level social activists working for social change. This time around other social activists of repute of Medha Patkar have come forward more openly and joined hands with Hazare upsurge. Lot of sympathy for Hazare movement has also been elicited in amongst other activists seriously committed to the issues of human rights. While others like Shabnam Hashmi, Mahesh Bhatt, Anand Teltumde and the noted writer Arundhati Roy have come out with heavy criticism of this Anna movement. Aruna Roy’s group has come out with alternative draft for Lokpal Bill. The dilemma for activists is what do we do? Do we be part of Anna upsurge and fight for getting his draft of Jan Lokpal Bill accepted or should we stand aloof from this movement. Surely Anna movement has at one level caught the imagination of a large section of people. The Lokpal Bill idea was floated decades ago and many different parties have come to power during this time, but this bill remained unattended to. Janata Party, VP Singh, BJP led NDA all had put the proposal of a Lokpal bill in the cold storage. Anna’s fast has made it come to the fore. Anna movement came suddenly and soon was converted into a spectacle by the mobilization done by RSS-BJP-VHP combine. The same was hugely overblown by media which pitched in to give it the exalted status. Live coverage, hype reserved for a cricket match, all was on display. Most TV anchors were screaming and exhorting the people to be part of the Anna upsurge. The RSS mechanism, visible- invisible both, which is capable of making the Ganesh idol drink milk, came into action and candle holding middle class, the ‘Shining India’ class was there at Jantar Mantar in good strength. Bharat mata was in the backdrop and cry of Vande Mtram was in the air. RSS functionaries and associated godmen were around to mix overt faith with a particular type of politics. This politics, which earlier had by a different type of mobilization to demolish the Babri Masjid. This time around (August), when Anna went on fast again, this ’shining India’ group was joined in by other sections in larger numbers. Many sections who are part of this mobilization are hardly aware of what the real debate is about. Team Anna succeeded in projecting that they are against Corruption and those who are not with them are supporting corruption. The real issue that Anna wants only his draft to be made in to a bill within a stipulated time, went to the background in popular perception. Some other points related to the issue are worth giving an attention. One of these is as to how come the issue has been raised both by Anna and Ramdev around the time when some corporate executives were arrested for corruption and there was a fear that big honchos may also have to be behind the bars. And secondly, is it a mere coincidence that it is around this time also that many a cases against the crimes of Modi are coming to a stage where he may be pinned down. The Anna movement has two components. One is the core one, the one which has been called by political scientists as ‘Shining India’ or ‘the MBA type generation’. This class is receiving good packages and is showing its concern about social issues mainly by opposing state affirmative action like NAREGA or reservation for dalits. This is the class, large sections of which called for need to attack Pakistan in the aftermath of July 2010 Mumbai blasts. Second group, smaller and less assertive around this core of middle class is constituted by those deprived sections that are looking for a platform to express their anguish with the rising prices and problems of daily life, which is worsening by the day. While the ‘Anna protest’ is valid, the pressurizing of state-government to bring in a suitable law for Lokpal, one does not understand why the insistence by Anna, that the Bill must be passed in the stipulated time, and only his draft should be accepted. Anna’s group is not the only civil society group, there are other options also, which have come out with probably better alternatives and have tried to overcome the authoritarian nature of the Governments draft Bill and Team Anna’s draft bill. One means by this the draft by Aruna Roy group, which has been quietly working on it. Why is there this attempt to bypass the parliamentary norms, to rush through them? One knows the bills like RTI, took years to become the law. One knows the necessary bills like those against communal violence and for Right to Food are in the pipeline, and taking good gestation period. The haste can be understood only from the angle that this Anna’s attempt is an attempt to undermine Parliamentary system of democracy. Many sincere social activists feel that the present system has failed and needs to be replaced. Good enough. There are severe fallacies in the present system. Lots of lacunas, lots of inertia! So what is the solution? To change the government, as Anna is demanding,Lao ya Jao, (bring my Lokpal Bill or Quit)! This is a political call to bring in the party whose affiliates are mobilizing the middle and other classes and is distributing tee Shirts and caps “I am Anna Hazare”, whose volunteers have going door to door to whip up support for Anna. The other interpretation is that the parliamentary system will give way to a revolution, a better system. Many sincere social activists believe this. This is a sign of frustration with present state of things and also the lack of deeper understanding of logic of ‘democratic system in evolution’. Democratic systems can always give way to other systems, but surely those systems coming in place of democratic ones’ can only be authoritarian. Comparing this upsurge with the one in many Muslim countries is misplaced again. In countries like Egypt, Tunisia the authoritarian regimes are being replaced towards democratic ones’, with all their teething troubles. As such every mass movement does not bring in democracy. We have witnessed that in Germany Hitler’s also built up a mass movement, Hitler’s movement crushed democracy. Every mass movement is not for better values, Ramjnambhoomi movement was one such, which created Hate Politics and paved the way for massive violence. One welcomes mass movements as far as they are inclusive and within the democratic norms for the values of Liberty, Equality and Fraternity. The one being orchestrated around Anna Hazare, smacks of intolerance for other’s views and has lack of patience. There is a need to nurture the norms of Parliamentary democracy, which should be non-negotiable. The hidden/overt hand of divisive forces and the core composition of ‘shining India’ class raises lots of doubts about the democratic credentials of this current Ram Lila ground upsurge. Social movements and their campaigns must give direction to the democratic system, the government, the parliament. The space of democratic society is currently being usurped to do away with parliamentary democracy, it is a danger signal of sorts. In the core of this movement, what dominates is the superficial attitude to the widespread cancer of corruption. Corruption is being seen in isolation. The point to remember is that corruption is a mere symptom of a disease, and not the disease by itself. The deeper disease, which is the system based on inequality lack of transparency and lack of accountability are the issues which need to be addressed by and by, that’s where we need to pay our serious attention to. Creating another unaccountable all powerful institution may be something worse than the disease the society is suffering from.